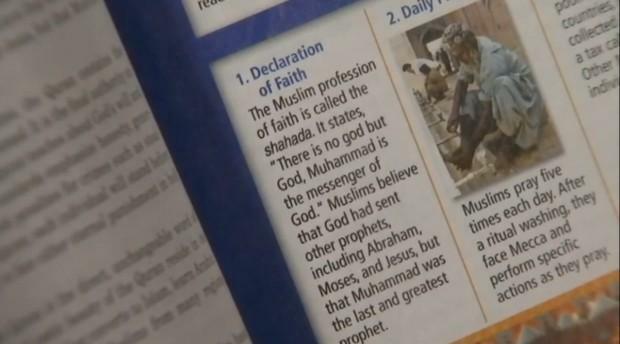 FFA - School district instructs students to recite Islamic prayer, read textbooks minus sections for Judaism and Christianity. The email for this articel has been deactivated for time. SEMINOLE COUNTY, Fla. — A history book used in school districts across the state is sparking controversy in Seminole County. A parent called 9 Investigates after finding out his son was learning too much about the Islamic religion in a public classroom. Wagner is not reading the Five Pillars of Islam from the Quran, but rather his son’s 10th-grade world history book from Lyman High School. “Students were instructed to recite this prayer as the first Pillar of Islam, off of the board at the teacher’s instruction,” Wagner claims. Wagner, who is not religious, said he had no idea the public school was teaching so extensively about religion until he spotted a text on his son’s phone from a teacher reminding him to complete a prayer rug assignment and study an Islam packet. Inside of the book is a chapter dedicated to the “Rise of Islam,” including prayers and scriptures from the Quran. What’s more disturbing for Wagner is that the first 100 pages discussing Judaism and Christianity are missing. The district blames a manufacturer defect in 68 books that are only a year old. Some other students interviewed by administrators said they were not required to recite the prayer aloud. They did discuss a video played during class about the religion, but Blasewitz got frustrated and stormed out when 9 Investigates asked whether the district is considering changes to the curriculum. “You’re just going to walk away from our interview when we’re trying to get information,” said investigative reporter Daralene Jones. Before Blasewitz walked out, he further justified the curriculum, saying students learn specific Judaism doctrine, the Bible and its scriptures, in earlier school years. “If anything, it’s a little imbalanced toward Christianity and Judaism,” Blasewitz said. Federal law allows schools to teach aboutreligion, because it’s part of history. But public schools may not teach religion. “There’s a difference between teaching of the significance or the impact of a religion and teaching the specific tenets of a religion,” Wagner said. 9 Investigates was told the district will reconsider this book when the contract is up in three years. Some districts in South Florida have requested the publisher rewrite portions because of the controversy. Public schools funded by tax dollars should not be instructing students to participate in the religious practices of Islam including but not limited to reciting prayers. Such activities go beyond education. How is it possible that school officials and teachers did not notice that 100 pages related to Judaism and Christianity were missing from textbooks? Mr. Blasewitz’s numerous statements to WFTV’s 9 Investigates appears to justify the recitation of Islamic prayer and omission of the 100 pages. Blasewitz said “The Pillars of Islam are benchmarks in the state curriculum.” Blasewitz “further justified the curriculum, saying students learn specific Judaism doctrine, the Bible and its scriptures, in earlier school years. “If anything, it’s a little imbalanced toward Christianity and Judaism,” Blasewitz said. His arrogantly walking out of the interview after giving this position is incriminating. Florida Family Association has prepared an email for you to send that urges Seminole County School District Board Members to rectify this situation.